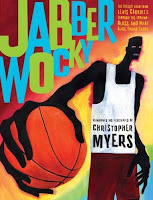 Christopher Myers' Jabberwocky is a phenomenal adaptation of the Lewis Carroll poem from Through the Looking Glass. This is published as a picture book, but don't let the packaging fool you. 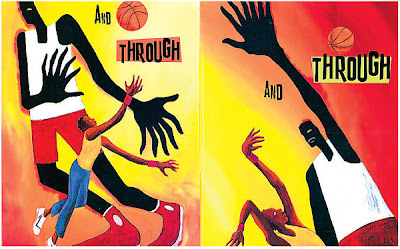 Myers has reimagined the classic nonsensical poem as a face off on the basketball court between the dark, shadowy Jabberwocky and a kid with vorpal blade shoes. The ominous swirl of black inks amidst the bright colors of the background turn the whimsical poem on its ear. Suddenly the light, funny, even bucolic poem is revealed to be dynamic, fraught with tension, and explosive. This is my favorite new read-aloud, my favorite new picture book, and it has renewed my love of the original poem. You don't get much more fantastic than that.